A cultural event open to all showcasing African cuisine, music and dance with artistic performances. 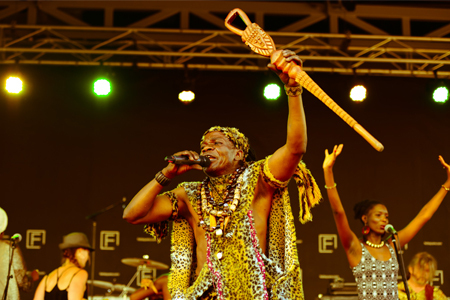 This year’s headlining act is Melbourne based King Bell and Soukous Ba Congo, a dynamic nine-piece African band. King Bell captures the audience with his passion while his band’s infectious rhythms range from exciting high energy dance to the slower more sensual rhumba rhythms of Central Africa. This year Guinean master drummer Mohamed “Bangourake” Bangoura and his half-brother Lansana “Sana” Camara will perform the raw power and rhythm of the Djembe and Doun Doun drums, perfectly contrasted by the Kora (22 string African harp) and Balafon (African wooden Marimba). Free African drumming workshops will be offered in Tank 5 between 10am-11am and 12pm-1pm on 26 May. Contact Simon Faulkes (contact below) for information about free African drumming workshops for children on 21, 22 & 24 May. Children who participate in the pre event workshops will have the opportunity to perform at the festival!